The last two weeks in France have literally ‘flown’ by! Looking back it seems like only yesterday we were eagerly driving to Lisbon Airport to catch a plane to Lyon. Our daughter, husband and Baby Piglet had just moved to their new home in the French countryside and we’d volunteered our services to help them settle in. Mr. Piglet’s DIY (Do-It-Yourself) skills were well utilized and a long list of jobs had already been drafted on our arrival. I was head cook and bottle washer plus baby entertainer and nappy changer. Their new home is approximately 250 years old – a rustic farm-house with a wealth of character features which gives the place a real ‘homely’ feel. The garden, approximately 1.4 hectares, is great but will be a full-time job in itself to maintain! There are several nut and apple trees along with vines and fruit bushes which already offered an abundance of loganberries, raspberries, red and black currents. This is exactly the type of garden I would love, but in Portugal living so close to the sea it’s just not possible. Apart from our last visit to France, when our daughter gave birth and we stayed in Valence, we had really only experienced French life in the city of Lyon. A country girl at heart I always felt uneasy in the city so I really appreciated the slower pace of life in the French countryside. The architecture, markets, villages and medieval towns such as Annecy and Chambery were a complete contrast to the towns and villages of Portugal. Shopping in the local shops and markets was great but I quickly discovered nobody spoke English. My pronunciation of words such as pain au chocolate and pain au raisan (please forgive the spelling) was apparently so bad I was greeted with a blank expression, a grunt and a shrug of the shoulders which immediately knocked my confidence. As I write this post I feel extremely sad thinking of my little granddaughter ‘Baby Piglet’; I miss her so much. I miss her smiley face as she greeted me each morning and even her shouting for food as she impatiently demanded to be fed. This is definitely a Mr Piglet trait; he also likes to be fed immediately he is hungry! She chuckled with enthusiasm at my renditions of the various nursery rhymes and lullabies such as ´Incey Wincey Spider`, ‘Rock a bye baby’ and ‘If you’re happy and you know it clap your hands’ to name a few. She was probably thinking “Poor Grandma, better give her a smile even though her singing is dreadful” It’s amazing how all the words and tunes of nursery rhymes and lullabies, unsung for a couple of decades, sprang so readily to mind. My singing is not that tuneful but at least it kept her entertained for a while. As I entertained ‘Baby Piglet’ I soon realized crawling around on the floor was a problem – I resembled a grounded whale or should I say Jabba the Hutt!. Perhaps NOW was a good time to start the 21 days without sugar diet I’d read on Nina Badzin’s Blog and stop procrastinating and just get on with it! I soon recognised how ‘Baby Piglet’ communicated her feelings as to when she was happy, hungry, tired, bored, grumpy or just had the grizzles. I discovered she is not a baby that likes lots of cuddles she is far too inquisitive. Instead she prefers to look round and explore the various rooms and their contents. Her little mind, like a sponge, soaking up the running commentary I gave as we walked from room to room pointing out various items. During our stay, her French Grandparents came for the weekend. Conversation with ‘Baby Piglet’ reverted to French and I felt like a spare part, an outsider. I did not have a clue what was being said and a wave of panic and sadness washed over me as I thought – one day I may not be able to converse with my granddaughter because I can’t speak French! Berlitz courses are still available, I believe; those courses where you learn intensively. There is distance learning available. Might be worth Googling. You know what they say – “You are never too old”. Now you have a good reason to learn, but I suspect that there will never be a language problem between you and Baby Piglet – love conquers all. the body is willing but the memory just does not wanna know! I am sure we have a memory shelf as we get older! Don’t worry. From what I gather Baby Piglet’s parents speak French AND English so the little one may well be duel linguistic, or whatever the term is. But like Barb19 says, now you have a reason to learn. After reading your blog for some time it seems like you know more Portuguese than you realise! I reckon you can learn French given time. Nah my Portuguese is rubbish but I can honestly say it’s not through lack of trying! Perhaps if I try and learn French again I may find it easier! French is easier than Portugese I believe, so if you can learn Frenchm you may then find Portugese easier. Mind you, this statement is from a person is useless at languages herself! All those years of French and Latin (yes, Latin) at high school and I think I can still ask you the time or to open the window in French! On a good day! wish I’d spent my time now learning French rather than Portuguese! I’ve even forgotten how to ask the time in Portuguese…LOL but I remember how to ask in French..it’s just come to me! Baby piglet is so sweet and adorable. I remember these early times of being Grandma and it’s just the best. Oh the new home sounds like a fairytale. I love old home-places like that. They’re so charming. II understand your worries about the language situation. I guess, if I were in your shoes, I’d try to learn some French. If nothing more than key phrases like I love you and You’re a sweetheart. 😉 I think it’s great that your Granddaughter will be bilingual and maybe trilingual if she decides to learn some Portuguese. Cool! Babies change so quickly. I certainly noticed many changes while we were with her for the two weeks. Key Phrases sound a good idea! think I may even start another blog to plot my progress so one day she can read it! I expect that she will speak both English and French . . . but it might be fun to learn some French for when you are visiting them. What about watching movies in French . . . with English subtitles. Or in English with French subtitles. Start with Amelie. Glad you had FUN ~ her smiling face made me smile. Great suggestion re films. I have been pondering long and hard re learning French I am just scared I will fail again! I just love your writing— your witty descriptions make me giggle. Mr. Piglet and the new grandbaby impatiently waiting to be fed, and you as a “grounded whale”?! I have no advice. My attempts at speaking French in France were met with that same indifference or worse, a subtle sneer as only the French can show so well. But it is a beautiful language. Keep writing, no matter what. Not many have your talent, and I’ve edited many though the decades. I love your description “My attempts at speaking French in France were met with that same indifference or worse, a subtle sneer as only the French can show so well. “…that is absolutely spot on! You have to experience it to understand it. She is absolutely stunnin g! I think anybody can do anything at any age. It all has to do with your willingness to stick to it. I think you’re not too old to learn. Go for it! You have nothing to lose. And you have a relationship with a granddaughter to gain. Good luck. Hopefully your daughter will teach her your language. It’s good to be bilingual. I know how you feel about the distance from your grandchild, especially when the other grandparents are close by. I have the same situation. I try nit to think about our grandson too much. It makes me sad too. Baby Piglet is beautiful ! I’m sure there will always be a bond-language will have no barrier- its in the heart-and the heart has no barrier to distant itself from feeling loved and protected. Great Post ! I am biased – she is beautiful! I can’t wait to hug her again! What a beautiful little girl! I enjoyed this post and love your honesty. I suspect Baby Piglet will be learning some English from her Mum. And, when you visit, you can supplement her English lessons. It’ll all work. I know it. Baby Piglet is gorgeous 🙂 I hated trying to learn french…maybe just talk baby until you figure out your own language to share together, heheheh…. A Chilean friend (who is trilingual) once suggested to me that I listen to music in Spanish. “Es una muy buena manera aprender.” So, I bought Nat King Cole’s “30 Greatest Hits in Spanish” and looked up the lyrics on the internet. Obviously, I didn’t become fluent from only listening to songs, but it did introduce me to words, phrases, pronunciation, etc. I make a ton of errors every day when speaking Spanish and I am a perfectionist who hates making errors! But I’m getting over “not getting it right” or “right away” and just doing it! I want to be able to communicate with the people in my adopted country. Hi Thorney Rose – A great idea! I am going to try and learn some phrases and I love the song idea! 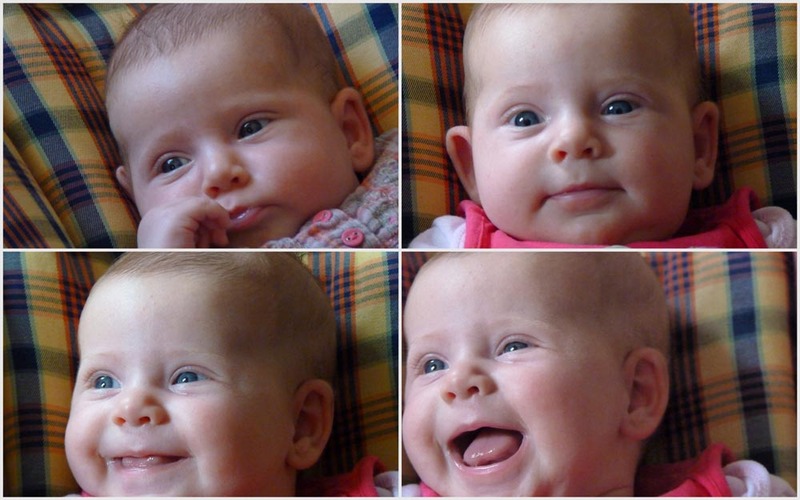 Yes, she is a very happy baby! Hi PiP, you sound in a bit of a state. I think maybe your emotions are getting the better of you a bit because you are away from your granddaughter and daughter and finding the distance a bit of an issue. Try not to worry, I agree with the others that to learn some key phrases would be a great start – she won’t be talking for a while yet so you’ve got time to hold a conversation with her when she does….besides, she will probably learn English in school, you will never be stuck for a conversation. The house sounds wonderful by the way, just my cup of tea! Love your writing. Reassuring to know your granddaughter teases you in English and she is just 3 1/2yrs old! Because we are so far away from our daughter “worries” are magnified! What a beautiful baby. I know you must miss her terribly. Hopefully you can make the trip to see her often. Oh, and your descriptions of the French countryside made me want to go visit a farm there with nut trees and Loganberries! Hi Carlaat their home in the French countyside is beautiful and reminds me to some extent of England which then makes me feel homesick. I am going to make another post with pictures. Portugal is beautiful but in a different way. I lived in France several years ago and granted, I had some high school French to draw upon, but I would recommend concentrating on learning vocabulary first. Pick the words that are most like English except for how you pronounce them, then add the ones that are the same as English except for an ending. Then learn the vocabulary for your most commonly used words for say, shopping, travelling, greetings, etc. Don’t worry about conjugating verbs or getting tenses right. If you have some vocabulary words you can usually get by. That, and hand gestures. No-one who can write as eloquently as you can is “bad at languages” Pip! Maybe you should start by learning to write French, and then try speaking. Hortophile flattery will get you everywhere! 🙂 Thankyou! Oh! Baby Piglet is LOVELY! Good luck with the French lessons–just think, before long she’ll be able to teach you! Every time I look at the above photo it makes me smile! The French will progress slowly and I’m sure she will ahve great fun teasing me with pronounciation! Mum, please don’t worry about language… we speak to her every day in English and I am also learning to sign with her, I will send you the link to the sign language site next time I’m on there. Yes, we spoke French to her whilst her French grandparents were here, we try and speak both languages as much as possible so that she gets used to them from an early age. Yes, I know but the French language and culture is her home. If I make a start now at least I can go into the local shops and do more than point and grunt! Or should that be grunt and point? hi, PiP… the baby piglet is sooooooo cute especially when she smiled. Comment ca va? That’s further than me! PiP, she is so beautiful. You must have hated having to leave her even if it feels good to be home! It’s tough leaving them isn’t… what a special blessing they are! Hi !! Piglet. Your grand daughter is already so big. She has a beautiful smile. You know, you can always turn to the international language of love. She will learn a few words of English, you a few words of French and everything with be just fine because you have love. I think from your responses here that you’ve already decided to try and learn at least some French. I think that’s very commendable and shows the love you feel towards your beautiful grandchild. I am British and live in Germany. My four children speak both languages and I expect my mother never thought for a moment about trying to learn any German in order to converse with her grandchildren. My husband is German and I know exactly what you’re talking about when ‘the family’ are talking in another language and you don’t understand. How long have you lived in Portugal? I’ve been in Germany for 7 years now and still don’t understand everything! !